The Viper Eel Snake is a natural representation of a real snake, as it slithers across the surface. The Daddy Mac Viper Eel Snake possesses a lifelike action as the bait is retrieved, just like the slither of a natural snake. 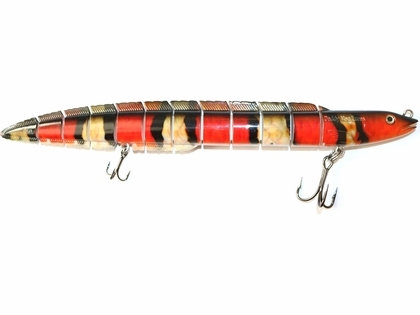 Featuring VMC treble hooks and 11 Kevlar linked splits, the Viper Eel Snake will be sure to get you bit!